Independent video game or “indie” games are video games that are often created without the financial support of a publisher. Many of these wonderful and unique titles just need some love to be found and cherished as the great pieces of gaming they deserve. Many great games got their start as an indie. 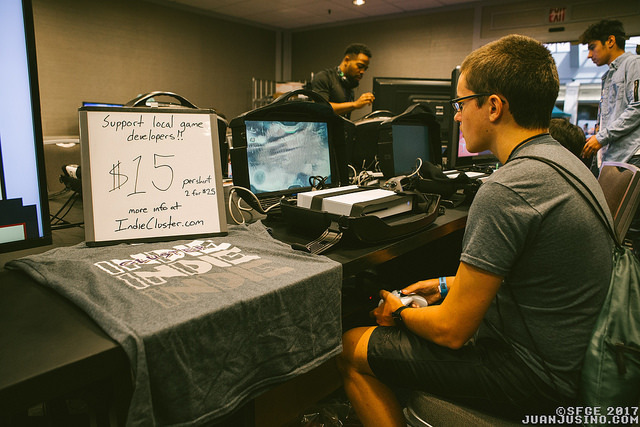 SFGE has supported our local indie gaming community and continues to welcome indies developers to apply to be part of our “Indie Game Showcase”. We supply the tables, chairs, power and audience and YOU supply your great game. We also have a special award for our BEST IN SHOW indie game for the event. All accepted games will receive an official selection email that includes your official wings and details about the event. Apply for the SFGE indie showcase below. * SFGE will supply location, table, power, and a weekend membership for the developer but INTERNET is not included. If you require internet for your game we can offer it for $50 for the weekend through the hotel. I understand I must provide all hardware for my game and SFGE is not responsible for issues that may arise with my hardware. I understand that wireless internet IS NOT available for free and has a cost of $50 for the weekend. I understand that the indie room has open hours and my station should be staffed at most times and when I am away (lunch/restroom) someone else is watching my station.